I love a happy accident. 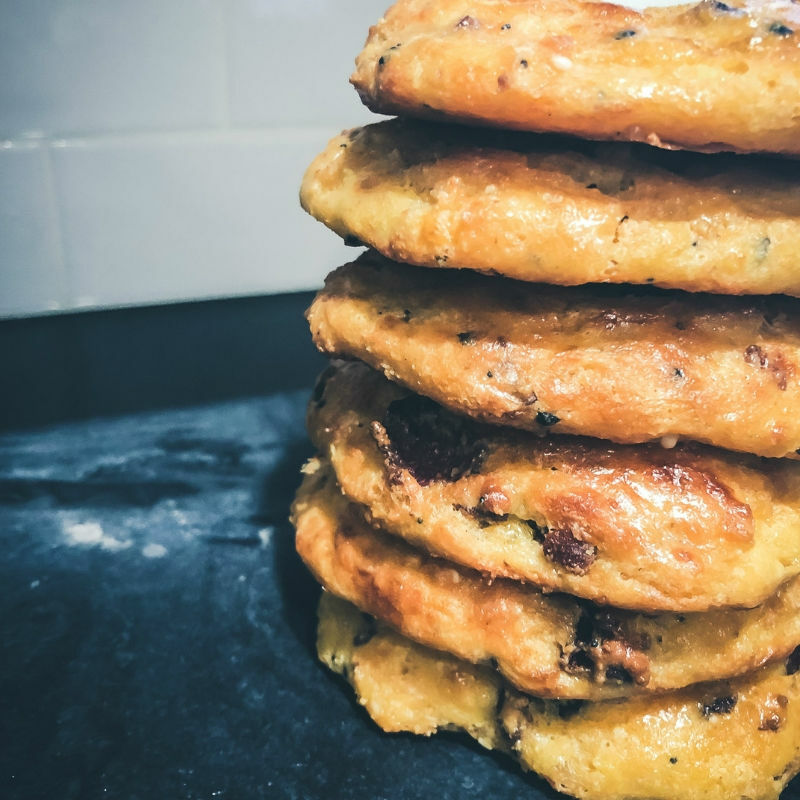 I was messing around in the kitchen last week and was craving something bready – the low carb lifestyle will do that to ya sometimes! Anyway, these bacon cheddar sandwich biscuits were supposed to be something else. I’m so happy the original recipe didn’t work because these are delicious! I’m a huge fan of keto bagels but was tired of making the same ol’ version I normally make (plain with bagel seasoning). 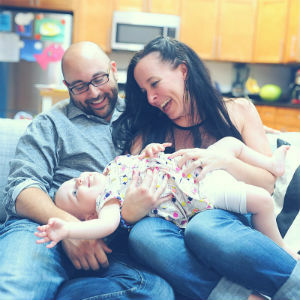 My heart was set on a really filling bagel – the kind I would go to a bagel shop and swoon over in my pre-keto days. So, I got to thinking and modifying and experimenting. 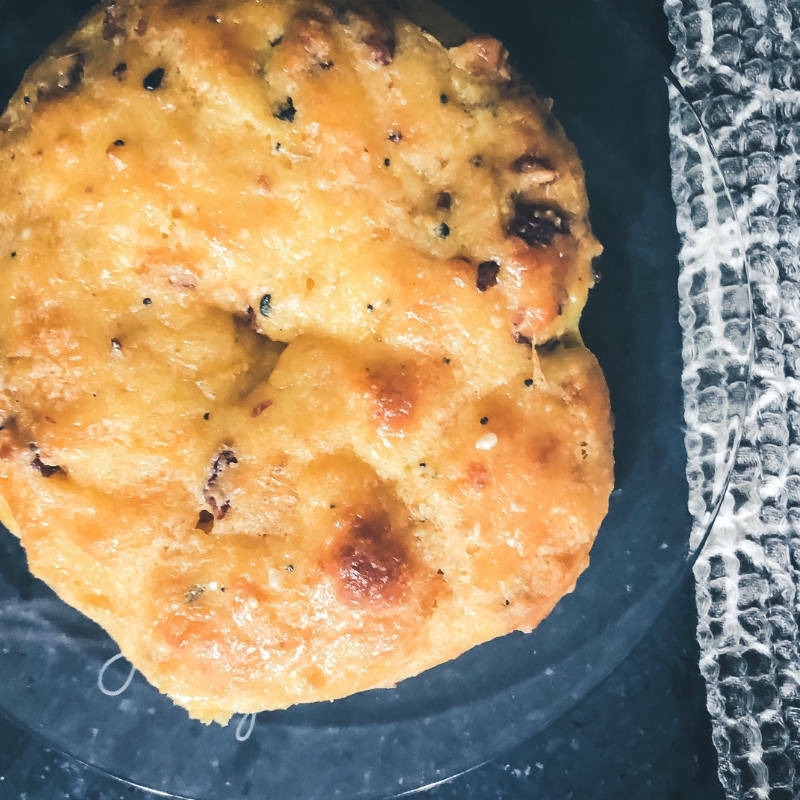 And, while I didn’t end up with bagels, in the end, I did end up with these bacon cheddar biscuits for the WIN! 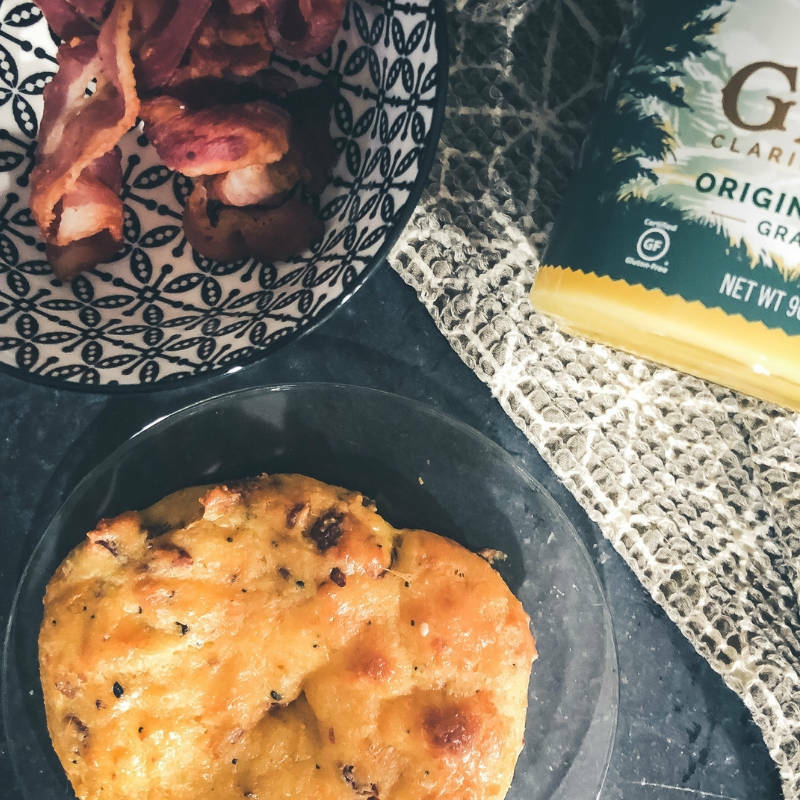 I don’t know if a sandwich biscuit is a real thing, but that’s what these bacon cheddar dreams feel like to me, so that’s the name they’ll get! As mentioned, they were originally supposed to be bagels, but they ended up spreading into a sandwich size roll with a biscuit feel. 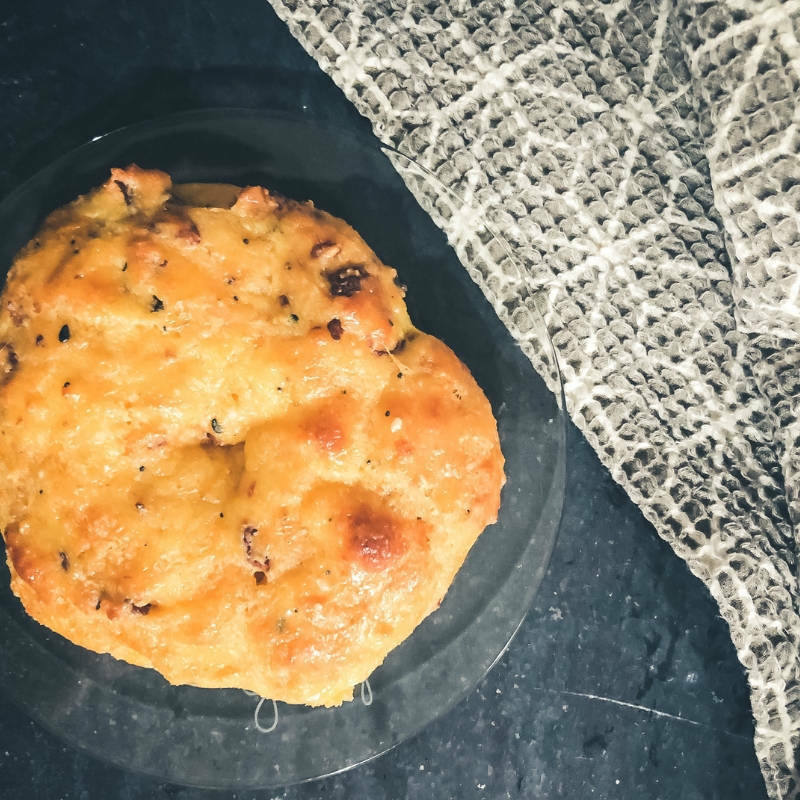 The hubs thinks they taste just like those cheddar biscuits you get at Red Lobster and I have to admit – they are a solid copycat (flavor wise). Anyway – we were planning on making bagal sammies for lunch and when these came out not bagel-y at all, I figured we’d use em’ anyway (and OMG…So. Good with a little mayo – you don’t even need cheese or deli meat – it’s all baked in!). PAIRS WELL WITH SOUP & SALAD! 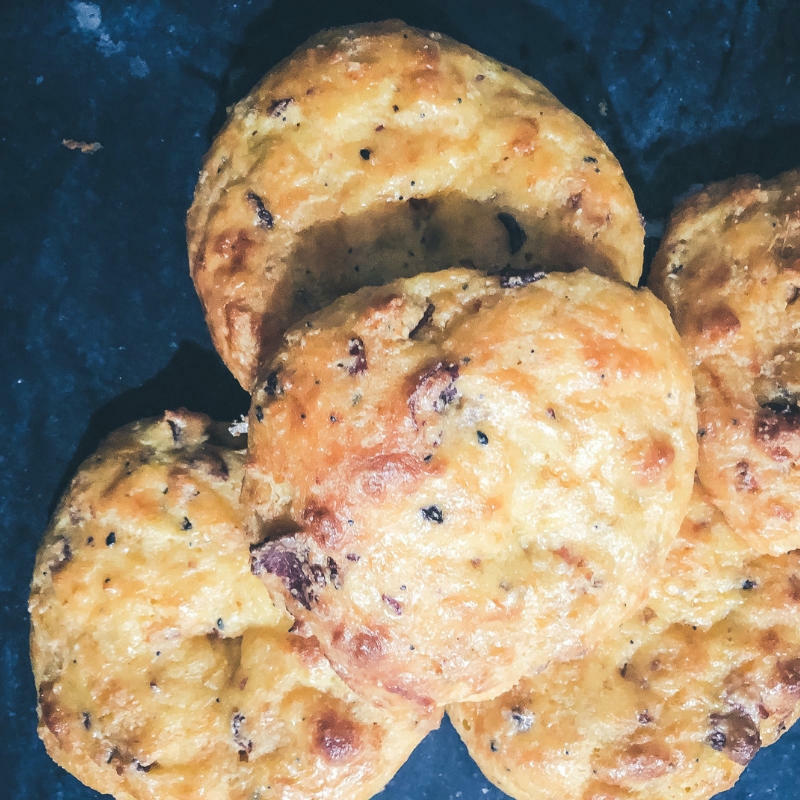 These bacon cheddar biscuits are super high in calories, fat, and protein – but if you want to pair them with a soup or salad, you can totally slice them in half and cut the macros in half, making it the perfect sidekick to a bowl full of veggies. Great for dipping in your favorite soup, bone broth or another hot dish too. They are so versatile they can be the meal or be part of the meal, breakfast, lunch or dinner. 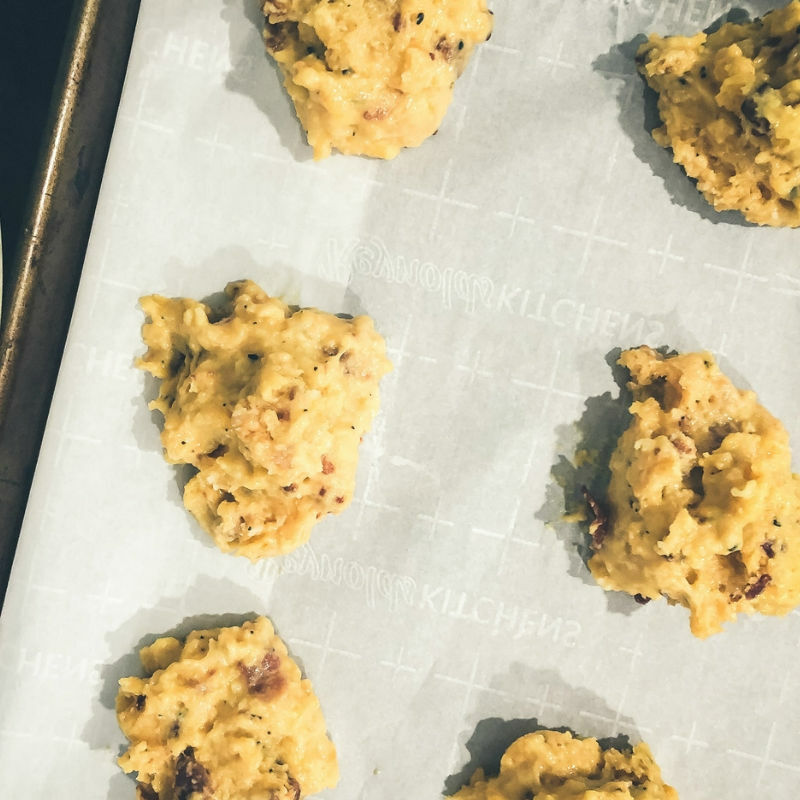 Like my other recipes, these bacon cheddar biscuits are impossibly easy to throw together. 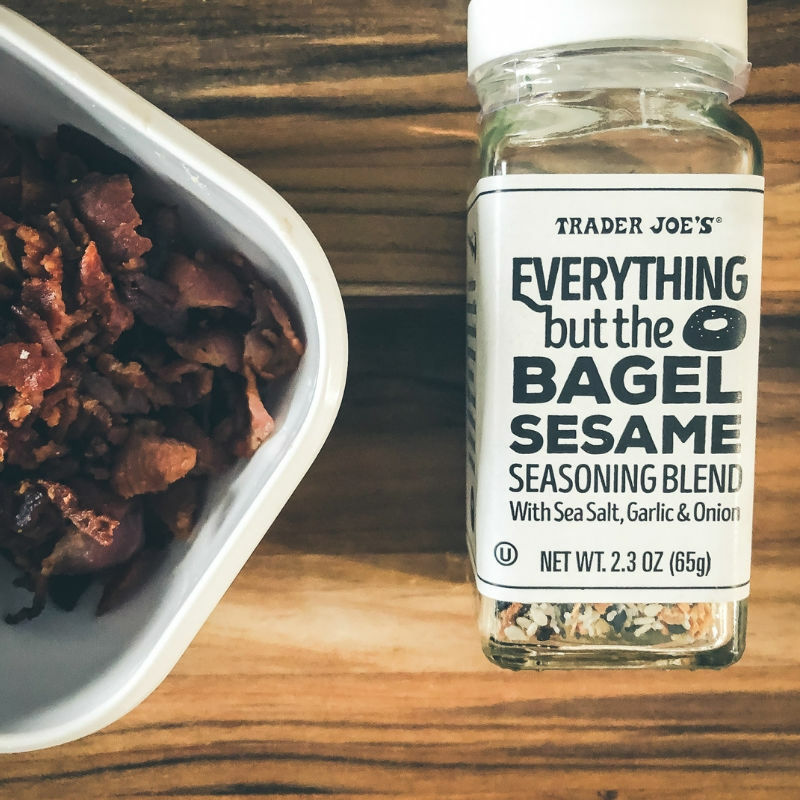 I precook the bacon and throw in a little Everything But the Bagel Seasoning while I’m mixing up the dough – this is a great way to ensure all of the seasoning goes into the biscuits – when you shake it on top before baking, you lose a lot of it in the pan. 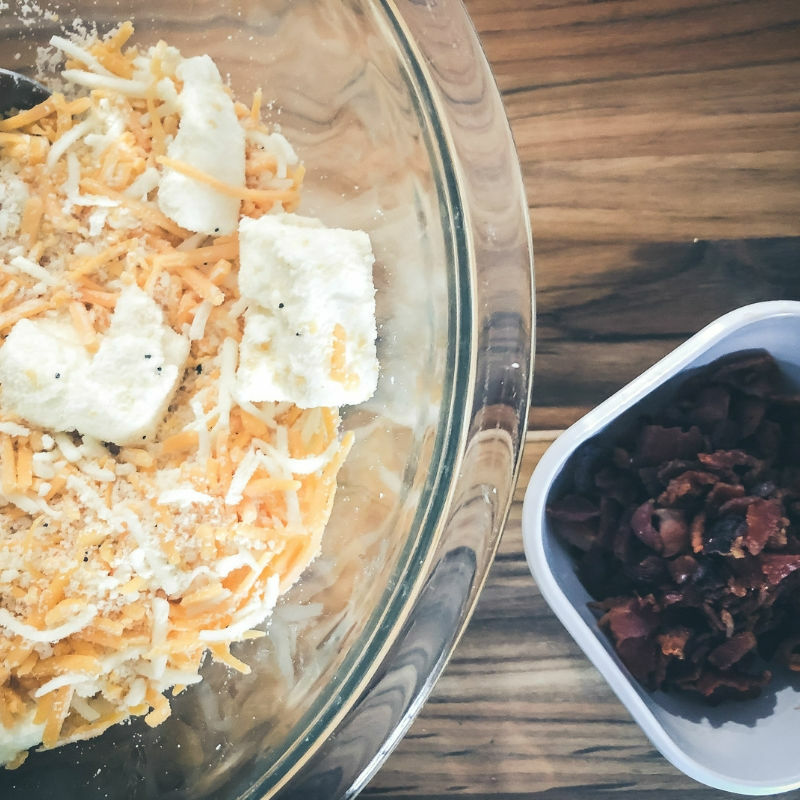 I throw everything in the bowl (except the egg) prior to microwaving it because it helps all of the ingredients mix cohesively and doesn’t seem to impact the end product. In fact, anytime I make a Fathead style recipe, I do it this way. After the dough is well blended, I separate it into six equal parts and “drop” them on the baking sheet (spaced accordingly). No need to roll them into a ball or form the dough. Dropped like this is perfect. But, I’m thinking they’d store wonderfully in the fridge in a sealed glass container (I use these ones) and warm up nicely if left out on the counter for an hour or so. 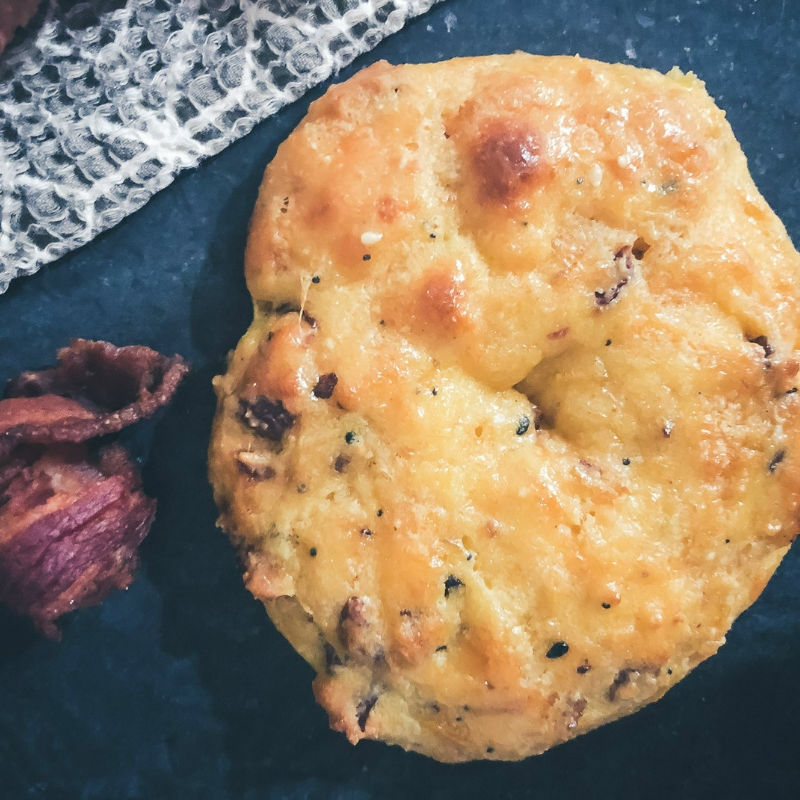 The recipe for these bacon cheddar sandwich biscuits is below – Let me know if you give em’ the ol’ college try! 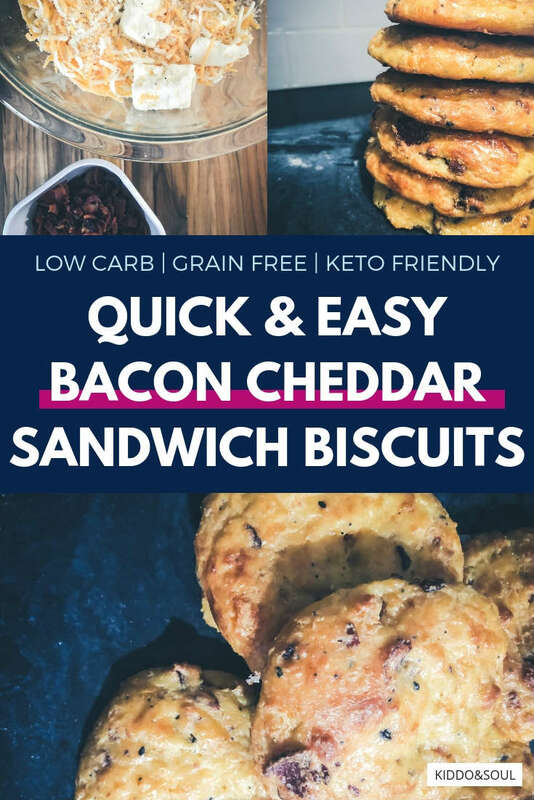 These grain-free bacon cheddar sandwich biscuits are perfect for lunches, dinners or as companion to soup or salad. They are large enough to create a sandwich and filling enough to eat as is. Preheat oven to 400 degrees and line baking sheet with parchment paper. Pre-cook the bacon according to instructions on package (or however you choose) and once cool, chop into tiny "bits" or pieces. 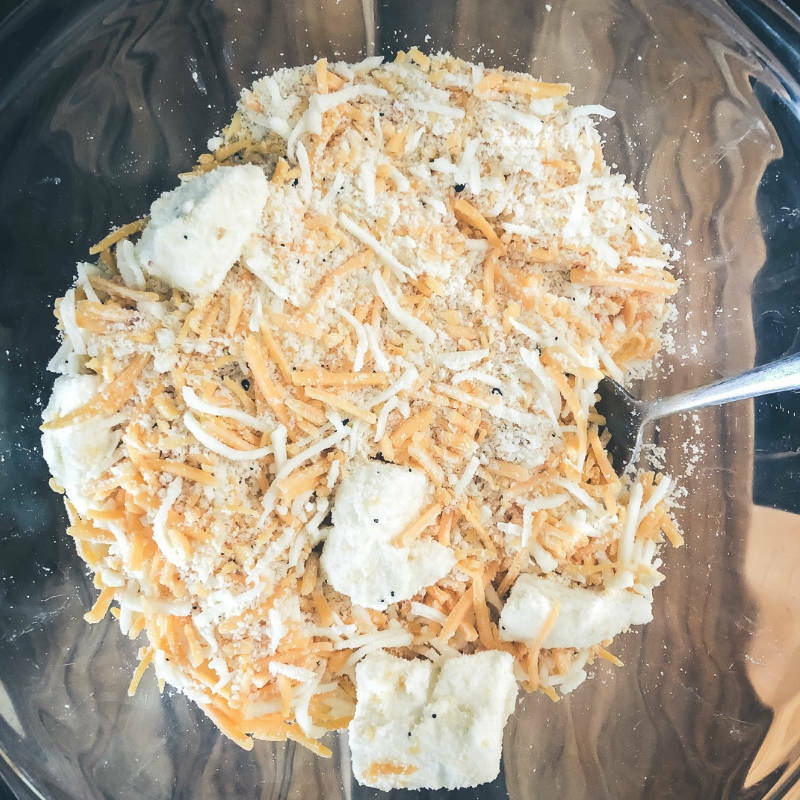 In a large bowl, combine the almond flour, cheese, cream cheese, seasoning and baking powder. Mix well. Add the bacon bits and mix again until everything is combined. Place bowl in microwave for 60 seconds. Remove, mix well and return to the microwave for an additional 30 seconds. Once combined, seperate dough into 6 even sections and "drop" on to baking sheet, placing at an equal distance across the pan. Bake for 10-15 minutes until dough takes on a golden brown color. Remove, let cool and enjoy! MORE GRAIN FREE RECIPES HERE!